Interior Minister Fernando Grande-Marlaska has called for Spaniards to defend the rights of the LGBT community in Spain, lashing out against those who spread messages of hate and exclusivity in a reference to the homophobic campaign rhetoric of the ultra-right VOX party and its leader, Santiago Abascal. In a speech Wednesday at Barcelona’s municipal Centro LGBTI, which was the target of a homophobic attack by vandals in January, Grande-Marlaska sad that the basic human rights enjoyed by members of the LGBT community are now in jeopardy because of the homophobic messaging of a resurgent ultra-right movement in Spain. “These rights that we thought were untouchable and that cost us so much to win,” Grande-Marlaska said, “are once again being threatened by the divisive model of the Iberian macho on horseback, accompanied by the sonorous music of the Novio de la Muerte“, referencing the battle hymn of the feared Spanish Legionnaires of North Africa who spread terror during Spain’s 1936-39 Civil War as they advanced across Spain. The ‘macho on horseback’ reference was a pointed jab at Spain’s new ultra-right VOX party and its leader, Abascal. Following the party’s unexpected win of 12 seats in regional elections in Andalucía in December, Abascal featured in a brief VOX video, appearing to be gathering a band of men on horseback in what implied a growing militia-style movement, reminiscent of the right-wing paramilitaries who spread terror during the civil war. The VOX video ended with the battle cry, ¡Andalucia por Espana! 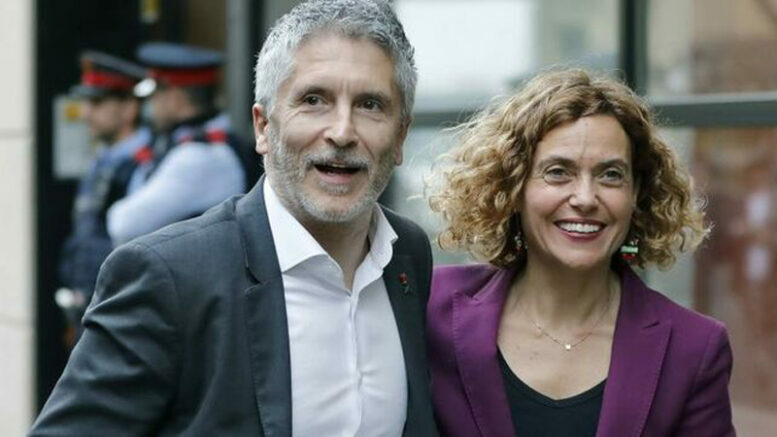 Grande-Marlaska, the first openly gay cabinet minister in Spain’s history, is a former criminal court judge who was recruited last year to join the Socialist party government of President Pedro Sanchez. A political independent, the Interior Minister is currently running at the top of the PSOE list of candidates for the Andalucía province of Cadiz in upcoming 28th April general elections. He was accompanied at Wednesday’s event in support of LGBT rights at the Barcelona centre by the lead candidate of the PSOE’s regional PSC affiliate party in Catalonia, Meritxell Batet, along with the party’s mayoral candidate in upcoming 26th May municipal elections, Jaume Collboni, and PSC general secretary Miguel Iceta, who is also openly gay.